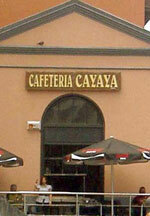 Cafeteria Cayaya a cheap Tenerife restaurant for insiders. Cafeteria Cayaya was a straight forward restaurant for little bites called Tapas but also served more than that. 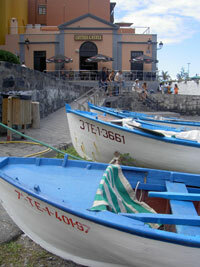 I used to go often to this convenient place by the central town square of Puerto de la Cruz. Tapas were consumed most in this bar style Tenerife eating place. Why? It's was not a so called gourmet restaurant, but for people who are thirsty and don't drink without eating. Why do I say was? Well this cafeteria was closed down in summer 2018. It now harbors a shop of the chain Ale-Hop. 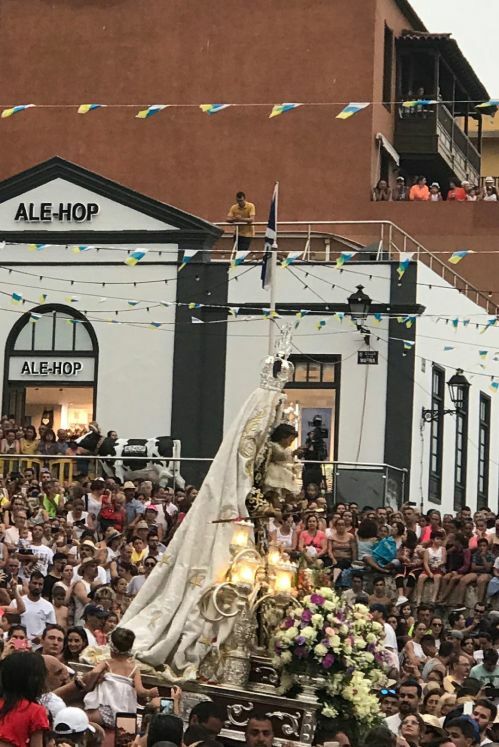 A Ale Hop shop instead of La Cayaya seen during Virgen del Carmen embarkment in prime harbor position on July 11th of 2018. And not to forget was the big and free parking space by the Muelle. All this now benefits Ale-Hop. It's the Muelle of Puerto Cruz harbor view which made the Cayaya "hangout" so captivating. You spotted wooden fishing boats with big, gaily painted bellies, a dry dock, an ancient fountain and shops depending on the direction in which you looked, while about 20% harbor area was hidden. Sun bathers and even swimmers inside the little port could be made out . You could watch a fascinating busy world by this ancient nook of town with long quays called Muelles. Casa Aduana Puerto's oldest building stands proudly on your right. Behind it by the water is the old fort. Fishing in this spot of the island is very popular. Cafeteria Cayaya had the ideal lookout for it. Tenerife fishing boats Puerto Cruz harbor. 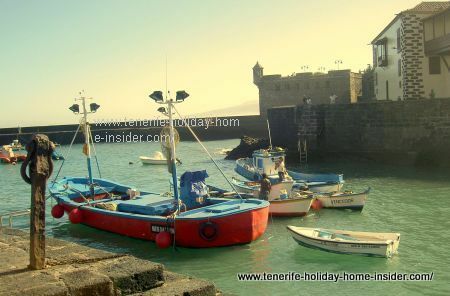 Tenerife fishing boats are returning from the ocean by midmorning and their seafood is sold on the quay. They were all bound to notice if Cafeteria Cayaya's front door was open or not as the photo reveals. The fishermen, sometimes, met up at Cafeteria Cayaca because, it was a true Spanish insider eating place for little Tapa bites. How could a restaurant refuse to give you food? I went to Cafeteria Cayaya again in September 2008. I picked a fish Tapa at the bar. I ordered a cool beer that goes down well with all Tapas. The barman told me that I couldn't have what I had chosen. He said he was sorry that it wasn't good any more. He took it back to the kitchen to throw away. I was asked to choose something else. Just figure that this waiter saved me from getting very ill.
Chicken liver Tapas at the Puerto de la Cruz Cayaya Restaurant Spain. 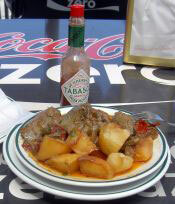 The photo gives you a good idea of the size of a general Tapa dish in relation to the Tabasco bottle. I am telling you those chicken livers were so good, so yummy I had to order a second helping. I also had to scoop up the delicious sauce with white bread. It couldn't be let to waste. One Tapa dish like that set you back 2 Euros. Perhaps, it was a bit more in 2018 before this cafeteria was closed for good. That regular Tapa price in that area was more than value for money. I forgot the beer price for the Dorada but, it was less than one Euro. Eat at home or at a hotel rather? Which tourist wants to wait and starve until getting back to the hotel or holiday home in Tenerife with such good little dishes to pick from? Sometimes, the Cayaya Cafe was closed. Don't worry... You could always go on another day. That way it felt like a real occasion to visit. I wouldn't have believed that Restaurant Cayaya's business went so well, had I not seen it myself early in November 2011. That's when a bulldog was sitting on the terrace of this dog friendly place. Restaurante Cafeteria Cayaya had extended in summer 2011 and included an Azotea rooftop restaurant. This was quite popular with Spanish and local people as well. You could see its gay red and white Coca Cola umbrellas from far, after you left your car at the Muelle quay for example. The restaurant Cayaya also served bigger quantities of the same Tapas on normal dinner plates now on its Azotea. I paid around €7 for a bigger portion of my beloved chicken liver meal, while a friend had a novelty fish dish for the same price which was also good. Another neighboring restaurant is Restaurante la Cofradia which is also now one of very cool Tenerife tourist attractions which draws much bigger crowds. The soft and exotic name Cayaya was indeed South American. It almost sounded like Cadgadgar or rather with a 'dg' like in the English word hedge. Want to know where the pretty word Cayaya comes from and its two different meanings? 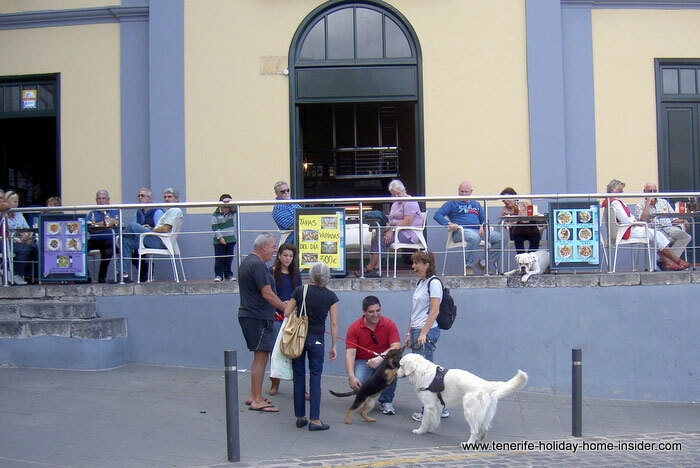 Please, return from Cafeteria Cayaya to cheap Tenerife Restaurants with more insider places.